I found my latest bombshell while reading the 1956 book "The Report on Unidentified Flying Objects" by Captain Edward Ruppelt, the original head of the Air Force's UFO investigation unit, Project Blue Book. In Chapter 12, "The Washington Merry-Go-Round," Ruppelt recounts the sensational 1952 UFO flap over Washington, D.C., our nation's capitol, and he drops what I think is a pretty amazing piece of information: Ruppelt claims that he was forewarned. “The trend in the UFO reports that this scientist based his prediction on hadn’t gone unnoticed,” Ruppelt wrote. “We on Project Blue Book had seen it, and so had the people in the Pentagon; we had all talked about it." It could happen! It will happen! Oh wait, it already has happened! This passage blows my mind for a number of reasons. First, it indicates that there was some sort of scientific analysis being made of flying saucer reports even in the earliest days of Project Blue Book. Second, it indicates that there were clear patterns to flying saucer reports. Third, it indicates that parties unknown at the Pentagon were paying very close attention to UFO reports before the Washington sightings. And, finally, nothing seems to have been done after this moment to make use of this high level of analysis to make any further predictions about flying saucer reports. Surely this invaluable predictive analysis, once validated, would have become an integral part of Blue Book’s ongoing operations, and yet it is never mentioned again by Ruppelt or by anyone else associated with UFO study and research. Okay, commenters, time to earn your keep. Can anyone poke a hole in this account? Labels: Air Force, Captain Edward J. Ruppelt, Dr. J. Allen Hynek, flying disc, flying saucers, Pentagon, Project Blue Book, Project Grudge, The Report on Unidentified Flying Objects, Washington D.C. I don't wish to poke holes in any accounts like these. What makes me wonder is why UFO researchers and commentators have this fascination with stories from the 40s and 50s. Aren't there any current reports that could be researched? These stories are fifty to sixty years old. Everyone is dead and gone by now. Nothing will ever be resolved talking about Roswell and Aztec etc. Is it that researchers are just lazy and tend to want to write about these old tales because it is easy? I get frustrated with the UFO field. Remember the story of the sighting that took place at O'Hare airport in November of 2006. Whatever became of that? Hundreds of people saw the UFO, but a few weeks later the story was dead on the vine. It's a sad joke, but probably true. 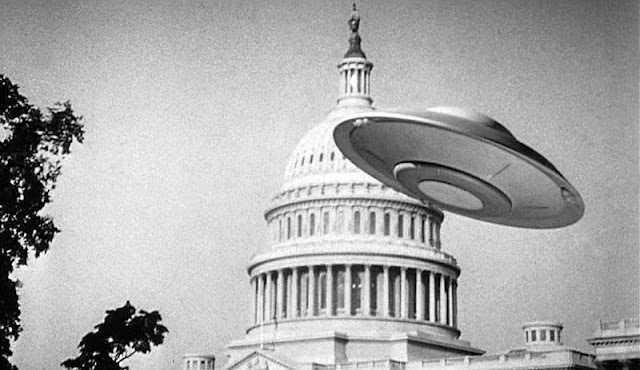 Unless some alien craft lands on the White House lawn, we aren't about to learn a thing anytime soon. There are two parties involved and either of them ain't talking. The government/military and whoever is behind the alien craft. Secrets are the password here and they don't want the rest of us in on the game. The reason O'Hare never got any traction is because none of the alleged hundreds of witnesses had the presence of mind to snap a single picture of the object. There is no supporting radar evidence either, no security footage - nothing. If we can catch images of meteorites and train wrecks with shocking regularity, the absence of corroborating evidence seems to indicate O'Hare is not nearly as good a sighting as folks want it to be. Stephenville, the other big 21st century case is likewise much ado about nothing. Good point, Department 47. But then again, even when there are solid radar readings and photos of a sighting, the media and the public insist that it doesn't prove anything. One thing that draws us back to the old cases is that, somehow, the "environment" was purer back then. People hadn't been subjected to a half century of aliens in popular culture. There were few ways, short of a camera and a frisbee, to perpetrate a hoax. And witnesses were willing to go on official record about their experiences. Today, everything is anonymous. If anyone does go on the record, they will often hedge their bets by saying, "I didn't see it until I looked at the photos later." That way, they're really not taking responsibility for what they are presenting. So, until something truly extraordinary happens, the re-hash of ever-more-ancient history will continue. I am betting that there is radar images and security footage. It is just that you and I will never see it. No government agency (FAA) is ever going to release that kind of evidence. It's time to go back to the tried and true Roswell stories... sigh. Interesting thought about UFO witnesses being "purer" back then, Department 47. One of the reasons I became a MUFON Field Investigator was to learn what kind of person reports a UFO sighting and why. In only a couple cases would I say that the witness was "contaminated" by overexposure to goofball alien TV shows on the History and Discovery channels, but the media saturation undoubtedly plays a bigger part than that.